Our heads have finally stopped buzzing over the off-the-charts week we had in New Orleans in December with all our friends and colleagues at the International Association of Exhibitions and Events. Both Jim and I worked at IAEE early on in our careers and it always feels like a family reunion when we go back. Kudos to the staff team for putting together the most sophisticated, value-laden event I’ve been to in a long time. Thanks, David Dubois, Cathy Breden, Scott Stanton, Marsha Flanagan, Scott Craighead, Rick Jennings, Karen Gonzales and everyone else on staff who worked so hard for us! So, what were my favorite things, you ask? (Well, I’m sure you DID ask, being a curious person). I was pretty engaged right off the bat, when I got to meet Pat, the incredibly smart bot from Event Bots, who contacted me a few days before the show. She (he?) greeted me, told me a few key things to know, and taught me the basic and easy steps for how to use him (her?) to find out anything I needed to know. Apps are great, but you still have to fire one up and search for info. With Pat, I just texted her/him a question and usually I got the answer I needed! The only thing better is having a two-way radio with someone on the other end who has a staging guide right in front of them (and even then, that person tends to get annoyed you don’t just look it up yourself). And I think there are so many ways to use a bot to enable the association and sponsors to connect with attendees, even pre-show, so that’s going to the top of my big idea file. My favorite giveaway was Beam, from A2Z. It’s a small round button about the size of a silver dollar, with a tiny screen. Using an app, you can upload just about anything to appear on the screen, from photos to logos to text, even gifs. I surprised my niece by uploading her photo and a birthday message and wearing it to her party. Of course, there are tons of ways to use it at a trade show, to broadcast your message or brand, and it is new enough it really grabs everyone’s attention. I also loved this cool thing called Zenspace. These futuristic (think George Jetson) pods were sound-proofed and comfortable, and a great place to have an impromptu meeting. Or honestly, what I liked most was just getting a few moments of utter peace and quiet away from all the friendly noise of a conference. 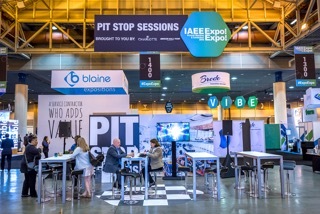 You could use these pods in so many ways really – give them to a big sponsor as a value-add, brand the pods and sell them, pay for them yourself to give attendees a way to connect, or add them to booths on the trade show floor as an upsell or part of a hosted buyer setup. Another simple idea was charging towers from Veloxity. What made these cool is they had little glowing lockers in each tower, big enough for an ipad, and you could lock them up and come back later. It was a lifesaver to be able to charge but leave it behind while we walked the floor. I’d say the only worry was remembering to go back and get it, but really, it’s pretty hard these days for forget your iphone when you look for it every 2 minutes. Of course, lots of branding opportunities are available. If you do headshots on your show floor, Trade Show Headshots is a cool option, as they superimpose interesting (professional) backgrounds which makes it a little different. I also liked SMT Expo for their backwall and sidewall options that you can print photos or graphics on, and they backlight it somehow and it looks really outstanding and eye-catching. I’d either use it as an upsell or again, give it as a perk to sponsors with in-line booths. Game Buzz was a big hit, providing super fun and interactive games with a buzzer that got everyone talking and laughing. I can see this as a fun addition to a party or as a value add to sponsor booths. Other honorable mentions are Core-Apps which for its beta version of augmented reality (point your phone at a sign and see the photo become video, for example) and ExpoCad, because apparently it has Alexa now integrated right into it. I have to see that demo, as I’m becoming very Alexa-adroit in my life, or maybe Alexa-lazy. Also, our friend Rich Stone, ExpoCad CEO, took a short break from his general session duties to propose to our other friend, M.T. Hickman, from Richland College, and she said YES! What a lovely surprise, and best wishes and congrats to them both. Of course, a trade show isn’t a trade show without promotional products, and it’s always fun to see what’s new and different. I got my usual bling from Marty Bear, who always shows up blinking and glowing and beeping and giving out all kinds of fun wherever he goes. My favorite, will-use-every-day giftie was from Freeman, who gave out classy, all white (small logo) double walled canteens. I’m obsessed with the stainless-steel double-walled, no sweat glassware so it fits right into my house. The Expo Group had similarly cool wine glasses in black. ExpoAnd of course, New Orleans was spectacular as always. I got out for some beignets at Café du Monde which I already meant to do but never did, and we sang some tunes with our friends at Lafitte’s Blacksmith Shop, and ate a ton of great food. Which I swore never to do again but will of course always do again in delicious NOLA. Apparently, we meet again next year in Las Vegas, can’t wait!